Perfect Accessory for any Garage, Man Cave, Office or Race Room! 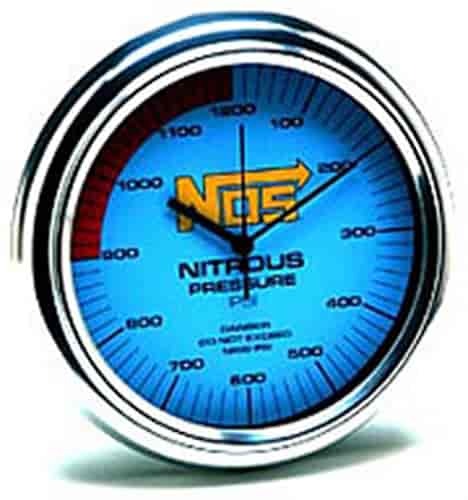 The NOS Clock is patterned after an NOS Nitrous Pressure Gaugeand features a 100-1200 "PSI" display on the 10" diameter sky blue face surrounded by a 14.5" vintage style chrome bezel! 19350 - NOS Clock - Wall Mount is rated 1.0 out of 5 by 1. Rated 1 out of 5 by chili B from Piece of junk So cheaply made ,it broke at it mounting area the same day I hung it up.